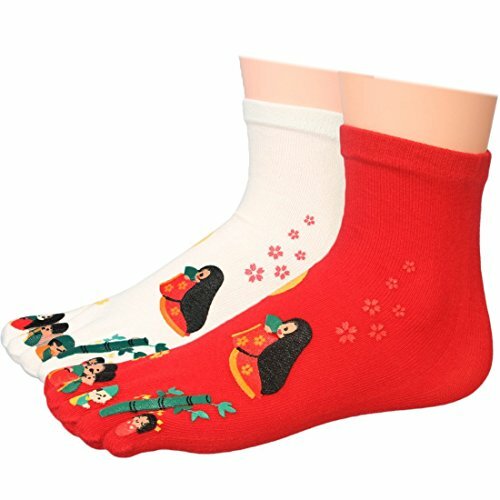 Put some fun colors and cute designs on your feet with these kilofly Japanese Kimono Girl Full Toe Tube Socks. This kilofly value pack includes 2 pairs of no heel cotton toe socks. These no heel socks offer a unique feature of flexibility with sizing, allows a wider range of styles from no show to quarter-length socks . Length of socks is 9 inches (23 cm). Give a pair to your sister, best friend, roommate. Wear them to parties, school, friends gatherings, and other fun activities. Colors may vary slightly from the pictures due to different computer monitors and their settings.